At least four FM radio stations of Radio City, the radio brand promoted by Music Broadcast Private Ltd (MBPL) may be on the block before the third-phase of FM radio policy rollout likely next year. Sources said MBPL is exploring opportunities to attract investors and may be willing to sell a majority stake in all its 20 stations at the right price. According to sources, Ambani brothers Mukesh and Anil, among others, have been separately in talks with MBPL. Sources said the first to go would be four stations owned by MBPL since 2001, operating in Mumbai, Delhi, Bangalore and Lucknow. FM radio policy clearly states that stations can be bought or sold only after fiver years of operations. 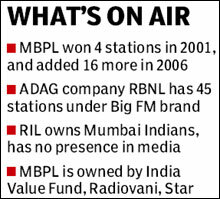 Experts said, MBPL could very well get an investor for Mumbai, Delhi, Bangalore and Lucknow initially, with an understanding with the investor that it will sell all channels in due time. When contacted, executives of Radio City declined to comment. Messages to Apurva Purohit, CEO, Radio City did not elicit any response. RBNL declined to offer comments and its chief executive Tarun Katial could not be reached. RBNL and MBPL have had several meetings and an announcement is likely soon, sources said. According to a senior executive at an FM rival, the deal may have been closed already with the whole network valued at Rs 400-450 crore.